India (19th century). Painting, gouache on paper. Appu [?] Sahib Patumkar [?] performing jogh, awaiting inspiration preparatory to turning [into a] devotee. Grasping the toes of the feet with both hands, [the yogin] should touch the big toes, one at a time, on the ears. 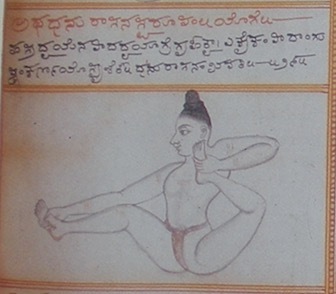 Although the Haṭhābhyāsapaddhati doesn't provide a name for this āsana, the artists of the Mysore Palace, who skilfully illustrated the chapter on āsana in the Śrītattvanidhi (19th century), borrowed the description from the Haṭhābhyāsapaddhati (fig. 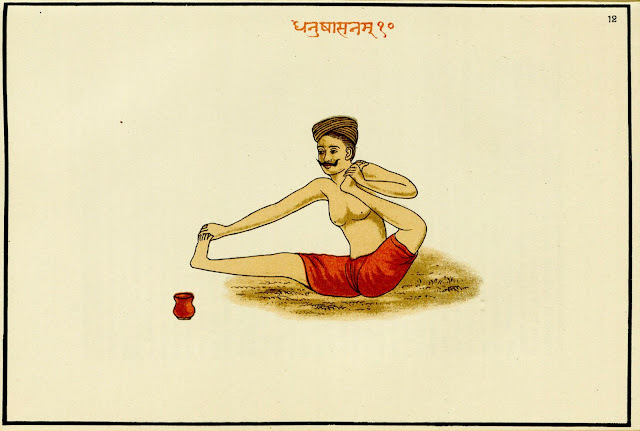 2) and named it the bow pose (dhanurāsana). Extending the legs on the ground like sticks, as well as the arms, both feet are held from behind and the body is moved like a bow. This is called bow pose. Seeing that both legs are initially straight on the ground, the above description could be referring to a posture similar in form to the illustration in the Śrītattvanidhi and the Wellcome's painting. A beautifully rendered illustration of dhanurāsana in a manuscript of the Gheraṇḍasaṃhitā (fig. 3) published in Fakire und Fakirtum im Alten und Modernen Indian (Schmidt 1908: 34, pl. 12) supports this interpretation. However, one wonders whether the word pṛṣṭha ('from behind') in the Gheraṇḍasaṃhitā’s description is indicating that both feet are held behind the body. If this were the case, one would have to assume that the yogin initially extends both arms and legs while in a prone position, holds the feet from behind (pṛṣṭha) and moves the body like a bow by pulling both feet towards the ears. This interpretation was adopted by Yogi Ghamande in his book entitled Yogasopāna-Pūrvacatuṣka (published 1905). He quotes the verse on dhanurāsana in the Gheraṇḍasaṃhitā and gives the following illustration (fig. 4). This form of dhanurāsana, which is a back-bending shape, is practised by most modern yoga lineages (fig. 5). It was popularised by the widely distributed book Yogāsanas authored by Swāmī Śivānanda, first published in 1934. Retrieved from the website of International Sivananda Yoga Vedanta Centres. It is worth noting that the earliest account of dhanurāsana is in the 15th-century Haṭhapradīpikā. Having held the big toes of both feet with both hands, one should pull [them] like a bow as far as the ears. This is called bow pose. The meaning [of dhanurāsana is as follows:] Having extended one hand by which the big toe is held, one should draw, as far as the ear, the other hand by which the [other] big toe is held. Brahmānanda's interpretation supports the version which is described in the Haṭhābhyāsapaddhati and illustrated in both the Śrītattvanidhi and the Wellcome's painting. Yogi Ghamande (1905: 30) includes this as another version of dhanurāsana and quotes the above verse from the Haṭhapradīpikā (fig. 6). The illustration depicts a slight variation in which the big toe touches the opposite ear. 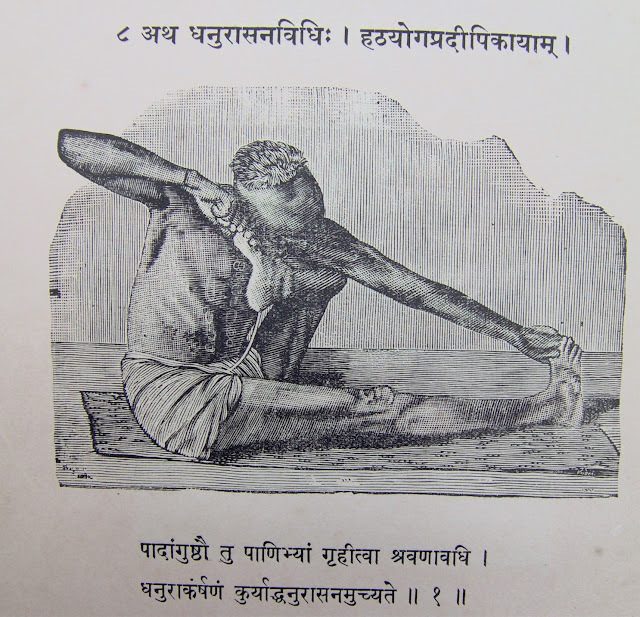 Both the Gheraṇḍasaṃhitā and the Haṭhapradīpikā were important sources in the revival of postural yoga in twentieth-century India. Therefore, it is possible that the ambiguities in their Sanskrit descriptions of dhanurāsana are responsible for the popular (mis)interpretation of this āsana as a back-bending shape in modern yoga. Thank you to Mark Singleton for providing the images from the Yogasopāna-Pūrvacatuṣka. Ghamande, Yogi. 1905. Yogasopāna-Pūrvacatuṣka. Bombay: Janardan Mahadev Gurjar, Niranayasagar Press. Śivānanda, Swāmī. 1993. Yoga Asanas. Sivanandanagar, India: Devine Life Society. Schmidt, Richard. 1908. Fakire und Fakirtum im alten und modernen Indian: Yoga-Lehre und Yoga-Praxis nach den indischen Originalquellen dargestellt. Berlin: Hermann Barsdorf. Sjoman, Norman E. and Kṛṣṇarāja Vaḍeyara. 1999. The Yoga tradition of the Mysore Palace. New Delhi: Abhinav Publications. Thanks to you both for the informative article! I do have one comment and question, I saw that Swāmī Śivānanda in his Yogāsanas also describes a variation of the prone bow pose, which is the same as on your Fig. 6 (right toe grabbed with left hand and vice versa) and called this "Akarshana Dhanurasana". Ever heard of that name elsewhere? His German student by mail, Boris Sacharow, also taught this position under the same name as well as the maybe more common, described above version of catching the toe with the same hand. And he proposes both as a preparation for (the hips in) padmāsana! This classification must also come from Swāmī Śivānanda, I suppose. So, what do you think, does this make sense historically speaking that this seated position was meant to prepare for a meditation posture? Sacharow by the way also teaches the prone position "Dhanurasana" like Śivānanda, which is then part of the "Bhujang"-group. It strikes me that the name 'Akarshana Dhanurasana’ is probably derived from the Haṭhapradīpikā’s description of the pose (dhanur ākarṣaṇaṃ kuryād). I’m not aware of a pre-modern source that has an āsana called ākarṣaṇadhanurāsana. 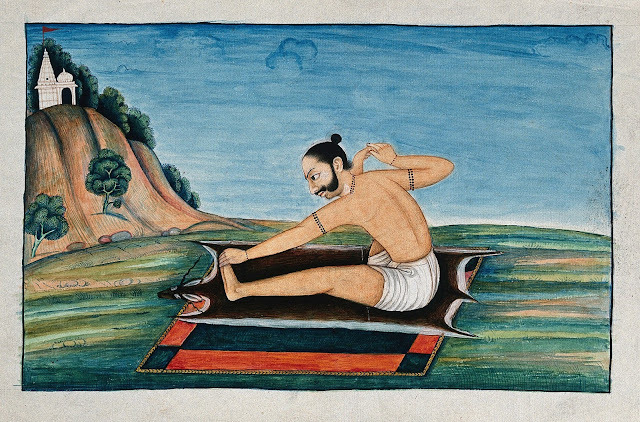 One might expect dhanurākarṣaṇāsana (the āsana of drawing the bow’).